The Pulitzer Prize-winning author of Cleopatra, the #1 national bestseller, unpacks the mystery of the Salem Witch Trials. It began in 1692, over an exceptionally raw Massachusetts winter, when a minister's daughter began to scream and convulse. It ended less than a year later, but not before 19 men and women had been hanged and an elderly man crushed to death. The panic spread quickly, involving the most educated men and prominent politicians in the colony. Neighbors accused neighbors, parents and children each other. Aside from suffrage, the Salem Witch Trials represent the only moment when women played the central role in American history. In curious ways, the trials would shape the future republic. As psychologically thrilling as it is historically seminal, THE WITCHES is Stacy Schiff's account of this fantastical story-the first great American mystery unveiled fully for the first time by one of our most acclaimed historians. Stacy Schiff is the author of Véra (Mrs. Vladimir Nabokov), winner of the Pulitzer Prize; Saint-Exupéry, a Pulitzer Prize finalist; A Great Improvisation: Franklin, France, and the Birth of America, winner of the George Washington Book Prize and the Ambassador Book Award; Cleopatra: A Life, winner of the PEN/Jacqueline Bograd Weld Award for biography; and most recently, The Witches: Salem, 1692. Schiff has received fellowships from the Guggenheim Foundation, the National Endowment for the Humanities, the American Academy of Arts and Letters, and the Center for Scholars and Writers at the New York Public Library. A member of the American Academy of Arts and Letters and named a Chevalier des Arts et Lettres by the French Government, she lives in New York City. "Dazzling.... Schiff is at her best, infusing a historical event with as much life, mystery, and tragedy of any novelist." "[A] beautiful retelling of one of our ugliest tales." "Her research is impeccable; no previous writer has scoured the documentary record to such great depth. Moreover, she has mastered the entire history of early New England.... This enables her to provide deep, richly textured background for specific moments and situations. Indeed, readers may experience her narrative as a virtual tour of the time and place. Her recreation of courtroom scenes is especially convincing; one feels, almost palpably, their pulsating mix of words, actions, and-above all-emotion.... Schiff's skills as a writer extend to such formal matters as structure, pacing, and point of view. The various parts of the narrative unfold in apparently seamless succession.... Now and again she inhabits her characters, yet she maintains throughout the authority of an omniscient narrator who is firmly in charge." "Haunting.... The first major commercial nonfiction book on the subject in decades. By sidestepping most of the popular theories, The Witches stands out from much of the existing literature." "History in the hands of Stacy Schiff is invariably full of life, light, shadow, surprise, clarity of insight, and so it is again and then some in her latest work, The Witches. Few writers combine as she does superb scholarship and an exceptional gift for language with amazing reach and agility of mind. This is a superb book." "Schiff brings to bear a sensibility as different from the Puritans' as can be imagined: gentle, ironic, broadly empathetic, with a keen eye for humor and nuance.... Thanks to this, and to Schiff's narrative gifts, the present-day reader flits above New England's smoky chimneys and thatched rooftops.... It is a wizardry of a sort--in a flash of brimstone, a whole world made wondrously visible." "Though the Salem story has been told many times, Schiff's splendidly written account brings it thrillingly to life." "Brilliantly assured.... Schiff's account is better written than any I have encountered." "Masterful.... Schiff painstakingly reconstructs not just the events of 1692 but the world that birthed them." "Haunting.... Schiff makes the dark an inviting place to linger." "This brilliant, compelling book is the most meticulously researched, effectively constructed, and beautifully written work I have read in a very long time. It is dramatic history and also a timeless thriller: who-or what-drove a New England town to madness three centuries ago, resulting in the deaths of nineteen men and women for 'witchcraft?' The answers are astonishing." "Brings a fresh eye to the worst misogynist atrocity in American history." "[Schiff] brings her gifts to the confusions of Salem, piecing together a dramatic narrative from disparate and often tersely unrevealing sources." "Once again Stacy Schiff dazzles us. The Witches is a must read for anyone intrigued by this baffling and horrifying chapter from American's Puritan past. What Schiff uncovers is mesmerizing and shocking. Her meticulous research and lyrical writing lay bare an injustice that we should never forget--lest we repeat it." "Thoroughly researched and written in a compelling style." "No stone [is] left unturned.... Schiff recreates the most chill-inducing, finger-pointing months in American history." "Brilliant.... Schiff writes movingly as well as wittily; this is a work of riveting storytelling as well as an authoritative history." "Masterly.... Alternately absurd and heart-rending." "Schiff's The Witches is an indelibly etched morality fable, the best recounting of the Salem hysteria in modern times. Clear-eyed and sympathetic, Schiff makes the complex seem simple, crafting a taut narrative that takes in religion, politics, folklore, and the intricate texture of daily life in Massachusetts Bay, with particular attention to those 'wonder-working' women and girls who chose this moment to blow apart the Puritan utopia they'd helped to found. It's all here in one devilish, oracular book." "The fullest and finest story ever told about Salem in 1692, and no one else could tell it with the otherworldly flair of Stacy Schiff." "With fresh feminist insight, Schiff plumbs the mindset of late-seventeenth-century New England to explain our original 'national crackup.'" "[Schiff] reconstructs the time and place in remarkable detail.... [And] skillfully re-creates the visceral tensions at the heart of everyday life in the Massachusetts Bay settlement." "Schiff honors her subject's gaping documentary absences by fleshing out the actual world in which the witch panic took root and thrived, showing the full range of factors that influenced its participants...with gratifying vividness." "Schiff delves into the archive to remind us that one of the most notorious miscarriages of justice in American history was also one of the few moments which featured regular women-not queens, not goddesses, but mothers and wives and daughters and servants-at the very center of drastic historical change. A wrenching, unforgettable read." "A comprehensive illumination of an unsettling period of American history that continues to captivate our cultural imagination." 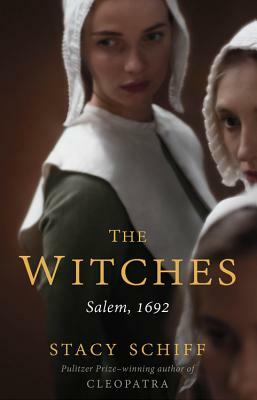 "A gripping, meticulously researched, sumptuously written history of the Salem witch trials and their historical context." "A masterful modern reassessment of the deadly and tragic mania that gripped the colonies in the late 17th century." "A vivid investigation of the original American nightmare. Schiff brilliantly teases apart the strands of myth and history. In an age when superstition remains a vibrant and dangerous force, her book is, alas, also relevant." "From Cleopatra to the Salem coven. From intelligent rule to hysteria, mayhem, and murder. The Salem witch trials offer Stacy Schiff an out-sized drama that seized Americans' imaginations more than 300 years ago. All of Schiff's books demonstrate her rigor as a historian and her dexterity as a stylist. The Witches proves she has something else: the instincts of a thriller writer. This book needs a seat belt." "Schiff writes with conviction and a strong sense of narrative, elevating the dry snooze of history to a new level. It's an endlessly fascinating read." "Compulsively readable.... The best-selling Schiff never disappoints." "[Schiff] writes with such spirit and agility that to read her books is something like watching a great dancer. To say that her latest book is fascinating and insightful is hardly sufficient. It's brilliant from start to finish." "Enchanting. Out of the shadows of the past come excitable young girls, pompous ministers, abusive judges, grieving parents, and angry neighbors, all of them caught up in a terrifying process that seemed to have no end: discovering who among them deserved death for being in league with Satan. The Witches is as close as we will ever come to understanding what happened in and around Salem in 1692. Courtrooms, streets, churches, farm yards, taverns, bedrooms-all became theater-like places where anger, anxiety, sorrow, and tragedy are entangled. An astonishing achievement." "Schiff's books are based on serious scholarly research, yet they're conveyed in bright, accessible prose... She displays the same sharp intelligence and eclectic interests that distinguish her body of work." --Publishers Weekly, "Most Anticipated Books of the Fall"
"Schiff has beautifully combined remarkable story telling with historical accuracy and insight. She has opened up important new avenues for Salem scholarship."